Baby needs a bib for his/her special day too! 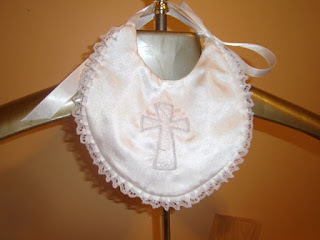 The bibs can be made to coordinate with with the custom made outfit & shoes. We will also be offering them for sale on our upcoming website. This one is embroidered in silver but we could instead embroider baby's name and christening day.